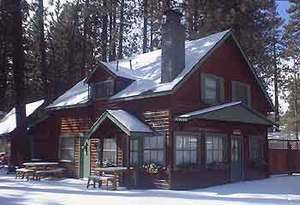 Max Occupancy: 18 Private historic big 2 story Big Bear Lake cabin with 5 bedrooms. 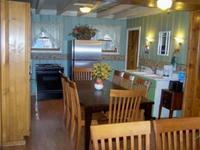 Large Vacation Cottage that has group accommodations: 4 bedrooms with mostly "Tempur-Pedic" queen beds and pillows and one with full bed, 1 bedrooms with "Tempur-Pedic" queen beds and pillows. (one bedroom is downstairs). 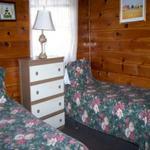 Sleeps up to 17 persons. 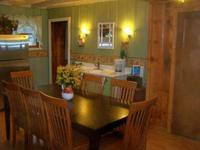 2 Full Baths (one upstairs and one downstairs). Big Jacuzzi Spa tubs in both baths. Large Living room with big brick fireplace and flat screen TV. Large Group Dining room with 2 tables. 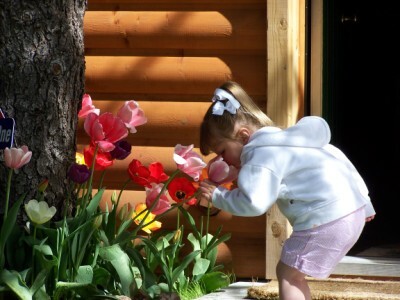 Big cabin sleeps 15 to 17 person family or group ( One of the biggest resort cabins). Patio area with two picnic tables and BBQ's. Private parking for up to 4 cars next to cabin. Not a pet friendly cottage. 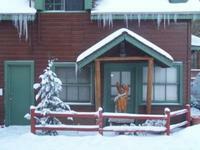 Use the... Property Map...button on our Home Page for exact locations of each cabin on our big resort property. Use the... Photos button at the top of this page for individual pictures of each cabin. 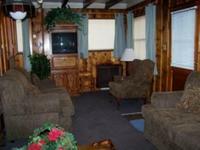 This big cottage includes flat screen TV with free cable, DVD player and music system. 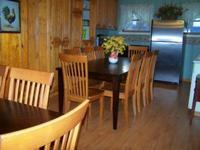 Kitchen is fully furnished with all of the amenities at our big AAA approved Diamond rated 4 family season resort. Linens, towels and daily maid service are provided...to see photos of large cottage #25 Bearberry Manor, use photos button.